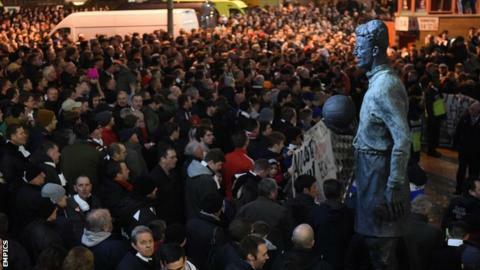 Charlton fans protested against Roland Duchatelet's running of the club on Saturday - both at The Valley and in the owner's native Belgium. About 20 Addicks fans travelled to Sint-Truiden, another club owned by Duchatelet, and protested at their home league game with Zulte Waregem. A section of supporters have questioned his motives and expressed their anger at the turnover of managers, the club's recruitment strategy and the role of chief executive Katrien Meire in running the club. Fans have formed a group called Coalition Against Roland Duchatelet (CARD). Supporters protested inside and outside The Valley for Charlton's dramatic 4-3 defeat by Reading, which kept them bottom of the Championship. The fans who travelled to Belgium, where Duchatelet's side lost 2-1, brought flyers in English and Dutch to hand out. Earlier this week, former Charlton striker Yann Kermorgant - who now plays for Reading and scored twice in Saturday's game - said the owner's vision for the Championship club was "deluded".